Central Idaho’s White Cloud Mountains are an amazing area home to some spectacular alpine scenery. I have been totally enamored by the range ever since my first trip in the White Clouds back in 2003. Then a couple years later I got addicted to mountain climbing. With those two obsession coming together, I began working toward a goal to summit all of the highest “White Cloud Peaks”. It turns out there are 50 peaks standing 10,000 feet or taller within the boundaries of the range. Going into this trip, I had summited 49 of them, and the last one was the remote and unknown Peak 10,340’. It was well off the beaten path, located in the southern White Clouds, the highpoint of a ridge separating McRae Creek from Alta Creek. After completing 10er #49 on Friday (Six Lakes Peak), and a good night of sleep in the back of my Durango, I met John F at Smiley Creek Lodge at just after 6am. We made quick work of the drive up and over Pole Creek Summit to the Galena Gulch trailhead, and were hiking by just after 7am. John had been up since 2:30am, but he didn’t seem tired. We flew up the first four miles of trail and made it the saddle overlooking the Boulder Mountains in just over 90 minutes. In spite of some forecasted rain showers, we could see nothing but blue skies on this fine October morning. Once at the saddle, we hung a left and headed east to the tarn at 9600’ where the first of days four summits, Simpson Peak (Peak 10378’), came into view. John was still moving fast, and I followed him up to the west ridge of Simpson Peak, where we had some great views of Deer Lakes far below us. After a quick scamper up the ridge, we made it to the summit of Simpson Peak where we had our first views of the rest of our route. We could see that we still had a lot of ground to cover! I’d traversed the same ridge back in 2012, and didn’t remember any serious obstacles. But as we got closer to Mount Anonymous (Peak 10356’), a big rocky outcropping came into view. Neither side of it looked appealing, but we took the north side, which eventually led us around the knob and back up to the ridge. After that, there it was just a bit of twisting and turning through some alpine shrubbery, and we made it to the summit of our second peak, Mount Anonymous. 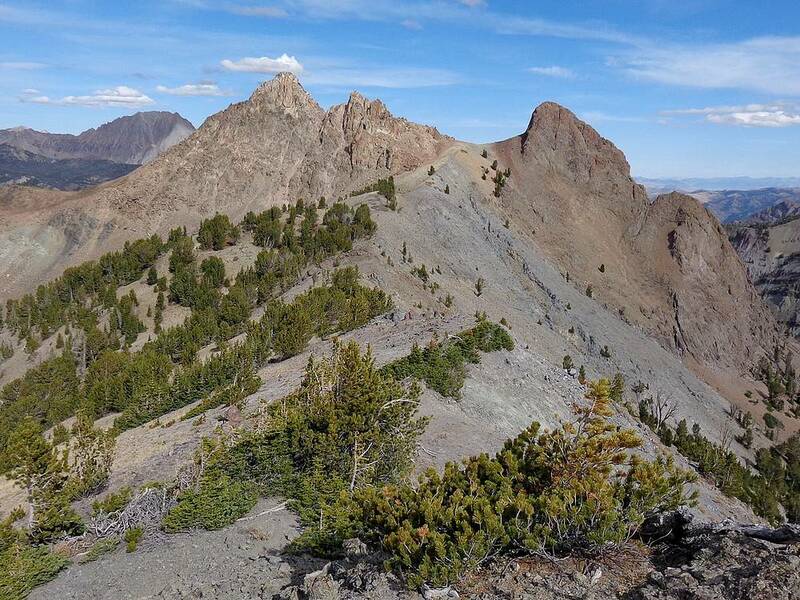 From here, we had a great view of our next objective, Alta Peak (Peak 10640’). Alta Peak is an impressive looking mountain, and it looked like it might be a tough climb. But less than 45 minutes later we were standing on the summit. We had stuck to the ridge where possible to avoid loose rock, and cheated to the south side when required. It was about noon at this point, so I sat down to enjoy my customary PB&J on the summit. It was a beautiful spot to sit and soak in the views of Castle Peak and the surrounding White Clouds. From Alta Peak, we could see north to our final objective of the day, Peak 10340’. This peak was my last remaining White Cloud 10er. I had taken photos of it from various angles over the years. But the route to the pointy summit wasn’t obvious. Only one way to find out! The ridge from Alta Peak to Peak 10340’ looked pretty straightforward most of the way. But we did have to deal with some tricky class 4ish down climbing in descending from Alta’s lower north summit. After that it was an easy cruise down the ridge until we got to the summit block of our final peak. Now all that was left was figuring out our descent route. We ended up going down the steep and loose northwest side of the peak. We just took it slow and had no issues. Once off the rock, we then made our way down off the ridge, wound through the trees further down, and eventually made it to a sporting log crossing on Germania Creek before finding the trail back the car. Nothing like a little gradual uphill to cap things off! What a day! John and I had been able to summit 4 peaks in just over 9 hours, covering almost 14 miles and 4300’ elevation gain. I’m very gracious to John for joining me on this excellent adventure. For me it feels very satisfying to have completed the White Cloud 10ers, a long time goal that had taken me just over 10 years to accomplish. To me it seems fitting to have done this the same year the White Clouds finally received wilderness designation. Map of our route, just under 14 miles and 4300' elevation gain round trip. We went counter clockwise. On the trail, nearing Galena Gulch saddle. Passing the tarn at 9600' with Simpson Peak in the background. Just below the ridge west of Simpson Peak. Looking down on Deer Lakes, Castle Peak in the distance. John reaching the summit of Simpson Peak. Summit splattski shot on Simpson Peak, Castle Peak between us. View of the rest of our ridge route from Simpson Peak. Looking back on Simpson Peak in the way to Anonymous Peak. John nearing the summit of Anonymous Peak. Alta Peak is very impressive from the west. White Bark Pine Trees growing on the west ridge of Alta Peak. Scrambling up loose talus on Alta Peak. Final section on the Alta Peak summit block. John reaching the summit of Alta Peak. Heading north along the ridge toward Grand Finale Peak. Tricky down climb north of Alta Peak. Getting closer to Grand Finale Peak. Summit block of Grand Finale Peak. Final nasty 75' up Grand Finale Peak. John about to summit Grand Finale Peak. Castle Peak from Grand Finale Peak. Me on the summit of Grand Finale Peak. My 50th and final White Cloud Peak over 10k. Summit of Grand Finale Peak, Alta Peak in the background. Intersting deep cracks on the south face of Grand Finale Peak. Huge White Bark Pine north of Grand Finale Peak. Final look back at Grand Finale Peak from the north. Passing through some volcanic boulders on the way down. Back on the trail and heading home.